TPO membranes are an eco-friendly building solution which demonstrates how technology has improved building materials and methods. 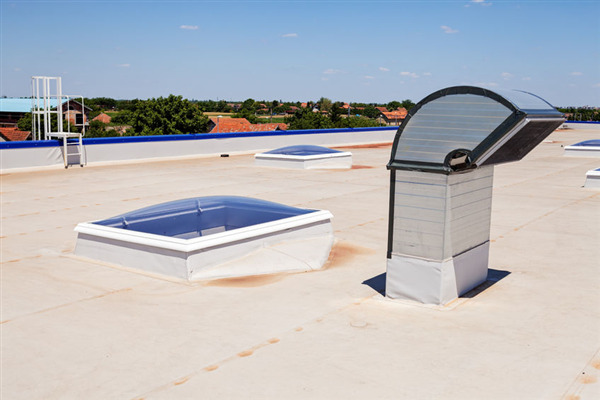 The roof can qualify for an Energy Star rating because of the way it reflects heat during the summer to lower cooling bills. The design of TPO roofing layers includes ThermoPlastic Olefin and a layer of polyester which adds structural strength to the roof's framing system. TPO roofing systems are nearly indestructible by North American weather patterns and will serve your building well for years to come. Rubber membranes are a more traditional means than TPO of protecting a flat roof. Rubber membranes also provide a durable reliability which will last for years with a minimum of annual maintenance. The membranes are fastened mechanically to the roof surface, and often covered with smooth gravel as an additional layer of protection and water dispersion. Today's rubber materials are constructed with technologies unavailable a few decades ago, and provide a great roofing material which won't fail if annual maintenance routines are followed to re-spread the gravel and assure chimneys and exhaust vents are properly sealed. Duro-Last is a modular brand of rubber roofing which is specifically manufactured per order for your roof. The system provides an environmentally friendly aspect of little waste while being designed and manufactured for the specific purpose of protecting your building. Duro-Last is one of the most economic roofing solutions available when you consider the cost per year over the life of the roof along with the value it provides the basic function of your roofing system and the value a proven performer adds to your building should you decide to sell. For these and other flat roofing products and services, contact A Plus Roofing Co. at 952-894-5435 to speak with a representative about how we can help your commercial building retain its value. You'll find our service to be courteous and professional as we work with you to find the best solution your building needs.